Well, this hasn’t gone entirely to plan, since I’m typing this on the way home from the Ford Fiesta ST launch, rather than on route to it. But what the hell – variety is the spice of life, right? And anyway, if there’s a car that deserves a mention regardless of timescale, it’s this one. 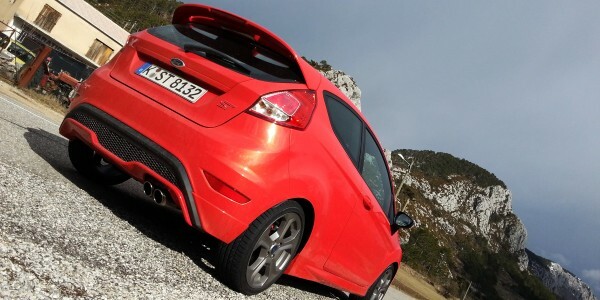 The new Fiesta ST is absolutely brilliant. I won’t go so far to say flawless, but the sheer scope of ability Ford has somehow endowed this little hot hatch very nearly completely beggars belief. So what gives? Behind the ST’s bespoke honeycomb grille lies a specially recalibrated version of Ford’s 1.6-litre EcoBoost turbo petrol, driving the front wheels via a slick, six-speed manual gearbox. “Homologated” in the EU at 182hp and 177lb ft, it actually overboots to 200hp and 214lb ft in extreme demand, and hammers 0-62mph into the dust in 6.9 seconds. At 47.9mpg and 138g/km CO2, it pleases the eco-police, too. But the raw figures only tell a tiny amount of the story. There is voodoo at work in the chassis here. Changes to the springs and dampers are one thing; it’s the new front suspension knuckles and 15mm ride height reduction that does remarkable things to the geometry at the pointy end, while a thicker twist beam at the back means the springs have less to do controlling the body roll in the turns. The result is lots of grips and beautifully progressive cornering lean, yet such a healthy amount of compliance it just will not get upset by mid-corner bumps or camber changes. Ford has even fitted a bigger motor for the electrically assisted power steering, to give the ST more positive feel. Which sort of works. By this point, the engineers must have already known they had a pretty seriously well sorted small car. But that hasn’t stopped them adding a magic ingredient: eTVC. That stands for enhanced Torque Vectoring Control – Ford’s best version of the by now familiar agility enhancing an electronic front-wheel drive torque management system that operates by minutely braking the inside wheel as it’s threatening to spin up and slip. Such systems are designed to allow you to carry more speed through corners; like a traditionally limited slip differential, except without the occasionally unpredictable response. Well, whoever’s responsible for finessing the eTVC for Ford should be certified as a genius immediately. It works like no other such system I have ever experienced. Which is to say although it clearly intervenes quite decisively – it must do, given the cornering speeds the ST will happily cope with – the intervention never ever feel clumsy, overwhelmed or unnatural. Achieving this must have taken ages. Pull all of these elements together, and you’ve got an engine that builds speed like a cable-snapped elevator at the top of a skyscraper, and a ludicrously mobile, throttle adjustable chassis that lets you take the most ridiculous liberties – and not only live to tell the tale but enjoy them so much you simply go out and do the same things all over again. Yet with such a torquey mid-range, you don’t have to rag right to the edge to make extremely fast progress. The manual gearbox means you always remain involved, the brakes give you both great bite and great feel, and the stability control turns all the way off. As in, totally. Prefer to retain that safety net but still do a bit of “skidding” (as the Ford press material scarcely believably puts it), then the Sports mode is for you. The eTVC stays active, regardless – murdering understeer before it’s even got out of bed in the morning. Frankly, I’m struggling to think of any other car that’s this fast, this much fun and yet so completely unintimidating. It’s a masterpiece. The kinds of people who are going to buy it are going to fall head over heels in love. And I don’t say that lightly. Especially when my next launch event is the brand new Renaultsport Clio, which I’m driving on Thursday – with the Peugeot 208 GTi to follow in a couple of weeks. Speak of which, here’s a bonus video of one of Ford’s “vehicle dynamics specialists” putting the new ST through its paces at the Lommel test track. You’ll see what I mean. Previous articleVW Golf R: a cult car in the making?